BEMF opened its Festival Concert Series on Monday night with Hespèrion XXI, augmented by members of Tembembe Ensamble Continuo in the rousing Folias Antiguas y Criollas. A capacity crowd filled Jordan Hall, eagerly anticipating the return of leader Jordi Savall to Boston, and they cheered the group’s creative, spirited performances with hooting and hollering. For this concert, Savall assembled a program inspired by the Spanish folía, one of several dance forms in which a chord progression repeats steadily, creating a framework for variation and ornamentation. By drawing from music of Renaissance and Baroque Spain and music of the Spanish New World, varying instrumentation and dynamics, mingling Native American and African elements with the polyrhythms of Moorish Spain, and leaving room for freewheeling improvisation, Hespèrion XXI and Tembembe enlivened a potentially soporific program of the same chord progressions repeated over and over again, exploring the links between the austere European Baroque and the Buena Vista Social Club. Seven chairs were laid out on the stage with a panoply of obscure instruments [see links below] even for BEMF, and the members of the two ensembles mixed among themselves. At the far left sat Savall, playing the bass viol and the treble vielle, two six-string instruments held between the knees like a cello, bowed with the right hand pointing down and palm facing out. Next to him, Tembembe’s Enrique Barona sang original (possibly improvised) lyrics, played a variety of guitars as small as the ukelele-like jarana mosquito, and maracas. Centered slightly behind the half-moon of musicians, Hespèrion’s David Mayoral played percussion, alternating between a tom-type drum, a tambourine, and a goblet-shaped drum with a tabla-like tone. Mayoral was flanked by two other Hespérion members: Xavier Díaz-Latorre, playing a giant theorbo and a guitar, and Enrike Solinís, playing theorbo, the double-strung vihuela and guitar. On the right, Tembembe’s Leopoldo Novoa sat on a marimbol and used it to set rhythmic bass lines, when he wasn’t playing a traditional Central American harp or the mandolin-like jarana huasteca. 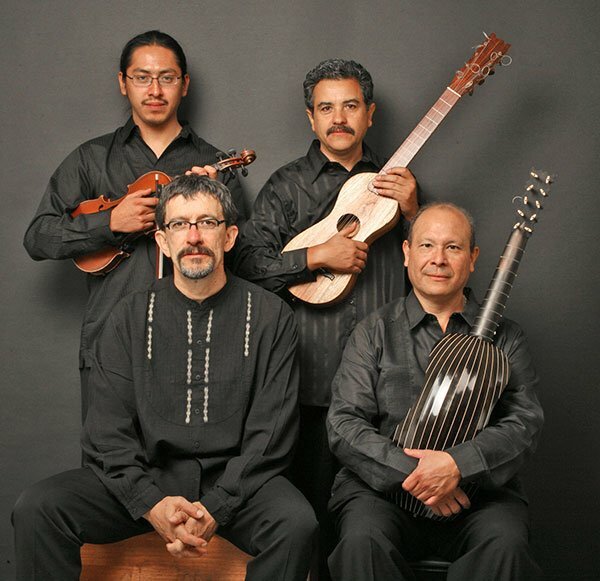 At the far right, Tembembe’s Ulises Martínez played violin, leona an extra-deep guitar-like instrument from Mexico, and a sleigh bell type percussion instrument. The first set of three songs began with “La Spagna,” a folía by Diego Ortiz, followed by two sets of improvisations around folía progressions. The set opened with Mayoral, drumming a simple rhythm on beats 2, 3, and 4. Savall joined at bass viol, along with theorbists Díaz-Latorre and Solinís, working lines of increasing virtuosity with Savall making progressively faster and fiercer ornaments sound easy to deliver on his most awkward of instruments. Savall also duetted with Martínez on violin, each player echoing and responding to the other player’s improvisations. The other members of the group entered bit by bit, often with two or three percussion instruments delivering complicated rhythmic interplay reminiscent of the best Cuban jazz. Guitars and theorbos alternated between delivering the unrelenting folía chord progression and working their own improvisations with playing styles reminiscent of the Arabian oud Spanish classical guitar, flamenco, and Latin pop and jazz styles. The seven players watched each other attentively, grinned gleefully at particularly clever improvisations (Díaz-Latorre was particularly fun to watch), and blended this panoply of instruments and styles into a rhythmically tight, tonally unified ensemble. 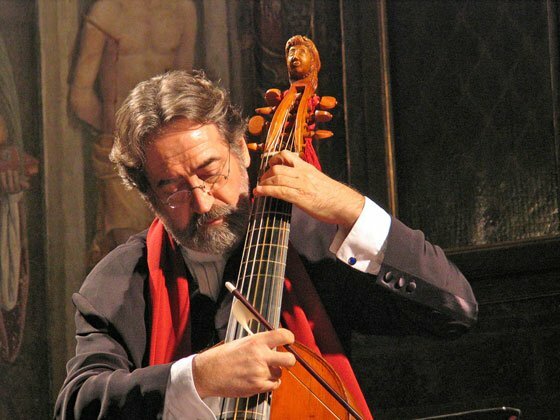 Soaring above all of this, Jordi Savall showed his ferocious technique on viol and vielle alike, negotiating blisteringly fast runs of notes with the keen attention on shape, rhythm, and harmony that all the world’s great virtuosos share. The subsequent sets followed a similar pattern, each offering one of the musicians a distinctive moment in the spotlight. Gaspar Sanz’s New World jácara called “El Pajarillo” featured Barona, singing an improvised text (my Spanish is a little rusty, but I think the general tone was about him being a tourist at the Boston Early Music Festival) and Novoa playing a striking solo on the Venezuelan arpa llanera whose tone has a peculiar un-harp-like ability to cut through dense textures. A set of six folía variations by Diego Ortiz ended with Barona doing a virtuosic maraca solo, playing a variety of complex rhythms and textures, a wide range of speeds, even striking the handles of the maracas against each other and setting up the unlikely use of the phrase “virtuosic maraca solo” in a classical music review. The final set of the first half, a Moresca by Pedro Guerrero, a folía variation set by the organ composer Antonio de Cabezón, and the earthy Mexican guaracha of Juan Garcia de Zéspedes featured some particularly deft echo duetting from Savall on vielle and Martínez on violin, and ended with the ensemble singing four part harmony with folksy abandon. The final set, of variations on “Todo el mundo en general” by Francisco Correa de Arauxo, improvisations on the Canarios, and the Galliarda Napolitana and Jarocho of Antonio Valente opened with soulful, long-phrased guitar playing from Díaz-Latorre, and ended with Savall playing impossibly faster than he had been playing all night, escalating energy and volume with the ensemble matching him step for step, until the group stopped on a dime, drawing roars of approval and a rapid standing ovation from the audience. Two encores — Sanz’s jácara “La Petenera” and a cochua published in Bolivia in 1778 — featured more singing by Barona which I couldn’t parse but also sounded original, more ensemble singing, and more lively playing which drew a surprisingly long concert to a spectacular close. It was an inspiration to hear this group work so carefully to dig up all manner of obscure codices, manuscripts, and publications, blend in a variety of living traditions, and created a new, vital art, drawn from the traditions but not completely bound by them. This seems like historically informed performance at its lively best, and well deserving of the near rock concert buzz from the crowd. Savall returns to St. Paul’s Parish in Harvard Square in March 2016 for a recital of Celtic music for viola da gamba and percussion. BEMF and/or the players should consider letting us explore an unfamiliar instrument up close. In this case not the precious instrument Savall told us dates from Venice 1553 (if I remember correctly), but the marìmbola that had many of us wondering. Thanks for those cross references.